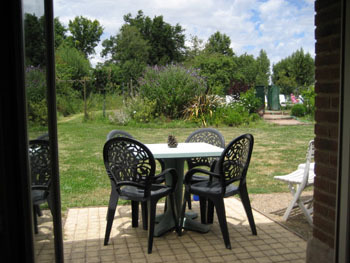 If you are looking for family friendly holiday accommodation in the Pays de la Loire or Charente Maritime region of France look no further, Our Cottages vary from 1 to 7 bedrooms, plus holiday complexes, and in combinations can cater for really large groups. Set in Rural tranquil surroundings allowing you to unwind in a truly relaxing atmosphere, yet both on site and nearby are all the activities needed to keep you and the kids entertained in as safe an environment as is possible. 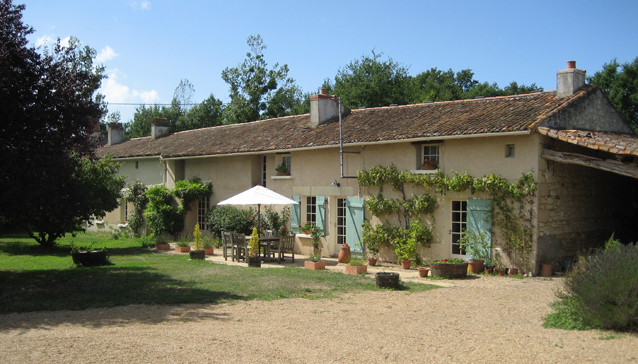 Farmhouse near Doue la Fontaine is situated in a tiny hamlet on the borders of the Maine et Loire and Poitou Charentes Departments of France. 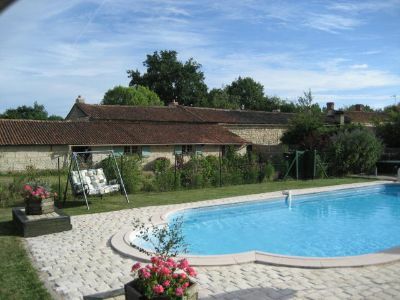 This Loire Valley self-catering Farmhouse offers peaceful and relaxing accommodation for longer stay and get-away breaks in a quiet area surrounded by vineyards and farmland but also cater for those wanting sporting or more active holidays. The property boasts a private heated swimming pool and games room as well as their own private tennis court which is available free of charge to their visitors. Local wine tasting, and nearby chateaux, fishing, cycling, horse-riding, and much more as well as good food, wine and very comfortable accommodation makes us an ideal choice. KITCHEN - BREAKFAST ROOM - Fully equipped with:- double bowl sink; fitted floor and wall units; pine dresser; lpg gas cooker with grill and auto-timer; microwave; dishwasher; very large upright fridge-freezer; small items such as toaster, coffee perculator etc; good quality cutlery, crockery, glassware and cooking utensils; wine rack; vegetable rack. 21" flatscreen TV. Dining table seats 6. French doors open out onto back garden and pool area. Side door opens to courtyard for washing line area. Room off Kitchen houses WASHING MACHINE AND full size BATH with shower above. LOUNGE / DINING ROOM - Dining Table; 2 dressers one housing extra cutlery, crockery and glassware. 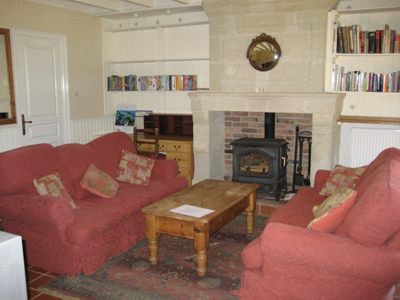 2 x 3 seater sofas; coffee table; glass-fronted log burner; Satellite TV ( 19" flatscreen) and DVD player. TV LOUNGE - 2 x 3 seater sofas; coffee table; glass fronted log burner; Satellite TV ( 37" flatscreen) and DVD player. BEDROOM 1 with en-suite SHOWER, HAND WASH-BASIN AND WC. 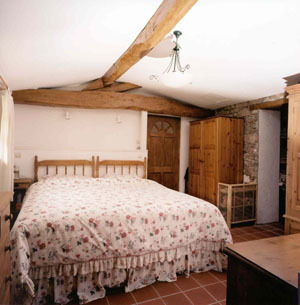 (2 further bedrooms upstairs). Twin beds or can be zip-linked to make superking double, Bedside tables and lights, 2 wardrobes; 2 chest of drawers, Windows looking out onto back garden. Floor standing fan. 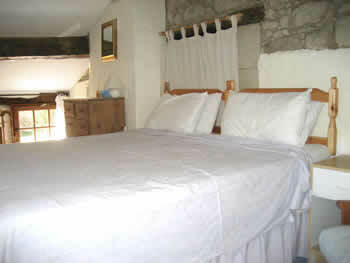 BEDROOM 2 & BEDROOM 3 - both with en-suite shower, wc and whb (all separate). Both bedrooms have good quality pocket-sprung 3' twin beds or zip-linked super king double, small wardrobe, chest of drawers, and bedside lights. 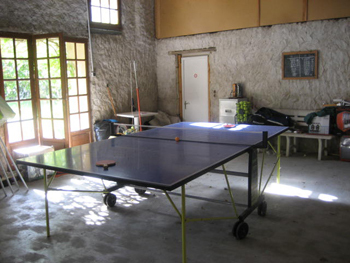 INDOOR GAMES ROOM (in barn) - Table tennis, darts board and basketball net; also contains outdoor games equipment. INDOOR GAMES - Monopoly, Scrabble, Articulate, Trivial Pursuits, Cards and Jigsaws. BOOKS - Many interesting books about the locality, it's history and natural history. HEATED OUTDOOR SWIMMING POOL - 10m x 5m with roman steps. Depths from 1m - 1.7m. Pool heated to 28° Celsius from May to September. Underwater lighting. Some pool inflatables usually supplied. The owners like to cover the pool every late evening, which in conjunction with the heat pump, will keep the pool up to temperature. GARDEN & POOL FURNITURE - Picnic tables, a sun lounger for each person, sun umbrellas, lounger side tables and a swing chair; charcoal BBQ. TENNIS COURT - Free unlimited use of the court. No children aged between 2 and 4 please. 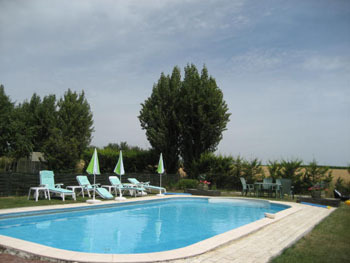 Prices include hire of bed linen, house towels but you will need to bring pool towels with you. Security deposit of £150 - this is fully refundable if no damage to property and left in a clean and tidy condition. Discounts are available to those willing to provide their own duvet-covers, pillow-cases and sheets. Duvets, pillows, mattress-protectors, flanellette-undersheets, and pillow-protectors will all be provided fitted and free of charge. Where clients do not possess their own superking or single bed-linen then duvets to suit clients own duvet-covers will be provided (free of charge) wherever possible. Please ask for more details. I do ask that guests don’t play music or radios outdoors. The option of superking-size beds is available to adult couples or adult singles but not to those under 18 years of age. We are situated amongst vineyards, farmland and wild countryside in a tiny hamlet between the modern town of Doue la Fontaine (7 miles), the mediaeval, beautiful but very small town of Montreuil-Bellay (8 miles) and the market town of Thouars (10 miles). All have weekly markets. Our local village is Bouille-Loretz, 1.75 miles, with bakery, butcher, tabac bar, corner-shop, doctor and church. 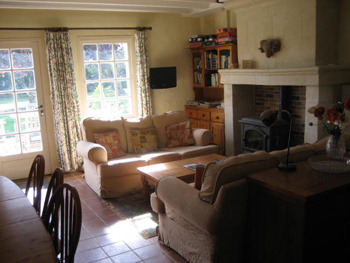 We share a quiet rural location with a sprinkling of other houses and offer you the ideal place to relax. 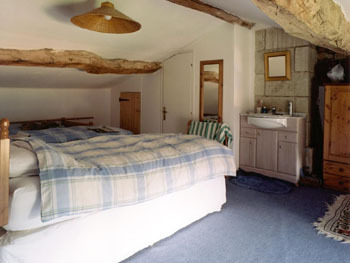 Located in the Loire Valley on the borders of Western loire and the Poitou-Charentes. More information of the Vendee beaches, attractions, activities, lakeside beaches etc available at the top of this page in the links box to the left. BEACHES - Les sables D'Ollone and La Rochelle are under 2 hours drive. 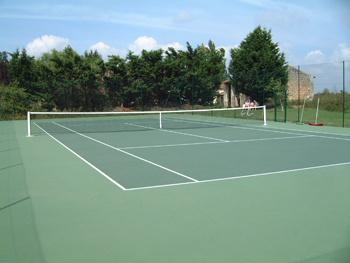 Tennis - We have our own acrylic court for your use, free of charge. However, there are local clubs with courts, including covered courts, which you can hire. Golf - Several courses between 30 - 55 minutes drive away - Saumur, Brissac-Quince; Bauge; Loudon (near Fontevraud) and Cholet. All are open to the public, in good condition, and bookings can usually be done a day or so in advance. We can book your tee times for you. Cycling - Our surrounding area is very suitable. Walking - We have the published walks from many local tourist offices here for you to borrow. You can also find walks straight from our premises and we can supply you with local maps. 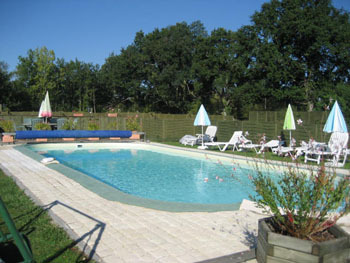 Swimming - We have our own 10m x 5m heated outdoor pool (May - September). There are heated outdoor and indoor pools in most of our local towns. Horse Riding - There are riding stables/schools locally. The National Riding School is near Saumur. You can visit and see the horses being trained for the military as well as dressage and 'shows' put on for public. International 3 Day Event is held at Verrie near Saumur in May each year. Activity Centres - Mainly for the younger members of the family. Our nearest is at Massais, 20 minutes drive. Climbing - There are some excellent rock faces 20 minutes away, but there is no instruction - bring your own gear. Fishing - Local lakes and rivers for fishing. Also PESCALIS, and international fishing centre for all kinds of fishing is about 45 minutes. Go-Karting - International Circuit for adults and children, 20 minutes drive. 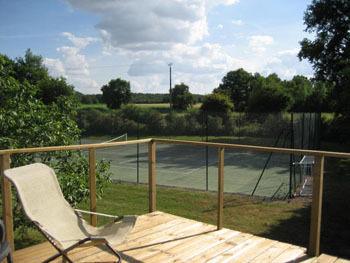 Squash & Badminton: - available at a small sports centre in Thouars - 10 miles from us. This centre also has 2 half-size electronically controlled ten pin bowling alleys. PUY DU FOU - Day Shows: Historical and ecological theme park with many spectacular shows - 4 outdoor and 1 indoors, as well as many smaller shows. Enormous fun for adults and children. Just under one hour drive away. Vikings, Roman Gladiators and Chariot racing, the court of Cardinal Richelieu, dozens of birds of prey flying around just above your head to the music of Wagner and Tchaikovsky and more. Night Show: starts when it gets dark for nearly 2 hours and each scene traces the history of the Vendee from mediaeval times through to the end of the 2nd World War. FUTUROSCOPE - North of Poitiers (1h 10mins) 10 cinemas - light and sound extravaganza. 'A good day out for all but the very young.' Almost impossible to do it all in one day during the summer holidays when it will be very crowded. 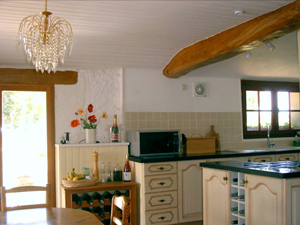 Chateaux - Architecturally stunning and steeped in history, found throughout the Loire Valley. Many of the most famous ones are accessible within 30minutes - 2 hour drive. Most are open all year. Wine Tasting - Available all over the area and open all year. Our local viticulturist speaks English and has up to 12 different Anjou wines to taste. Just beyond our Anjou area are the Saumur, Saumur Champigny, Touraine and Chinon wine areas. Saumur is particularly famous for its sparkling wine 'Saumur Brut' and around the area for 'Cremant de Loire'. It is the second largest producer of sparkling wine after Champagne, and you can visit the Sparkling wine houses of Saumur and see the whole process including the freezing of the sediment in the neck of the bottle, the removal of this and the final corking and wiring. Zoo - conservation zoo breeding endangered species at Doue la Fontaine (8 miles). Beautifully landscaped in a large quarry the animals have large enclosures, mostly in pairs as the zoo is part of a world-wide organisation trying to breed endangered species, including snow leopards. Very close observation points allow really closeup views of the animals in their natural surroundings. Bird Watching - The area has an abundance of bird life including many types of birds of prey as well as hoopoes. Troglodyte Caves - Caves and underground dwellings ti visit particularly around Doue la Fontaine and Saumur. Roses - Famous in this area and grown for export. At Doue la Fontaine there is a garden of 1000 different roses and several rose growers in the area where you can look and buy.